Lifelong homes and healthy, fruitful lives are at the heart of Arden, Freehold Communities’ new master-planned community in Palm Beach County. Each home at Arden is designed to bring people together, creating a sense of community and belonging. Ryan Homes is helping to make this vision a reality with their thoughtful approach to homebuilding and customer-first approach. 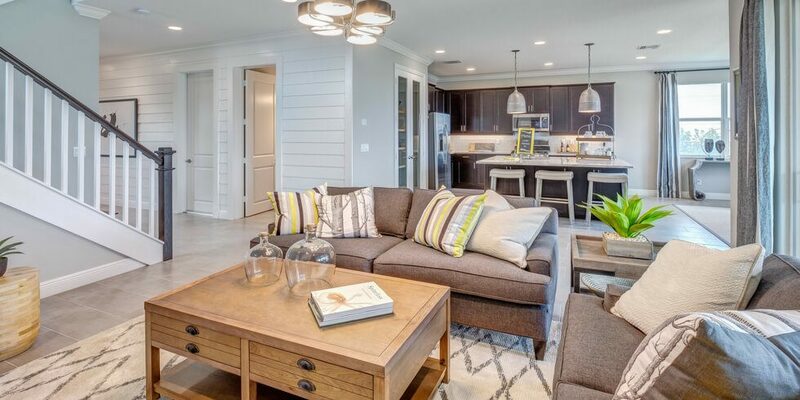 Ryan Homes is offering their Artisan and Homestead collections at Arden, featuring Farmhouse and Coastal-style homes set on 48- and 58-foot homesites. Starting from the mid $300,000s, both 1 and 2 level homes are available, ranging in size from 1,700-3,100 square feet with two to five bedrooms and two to four and a half bathrooms. Modern, open floor plans and nine-foot ceilings make every home by Ryan Homes feel open and inviting. Included features like a porch, impact glass front windows, tile in the wet areas, stainless steel appliances and granite countertops throughout make each home perfect for everything from summer barbecues and family holidays to elegant dinner parties and quiet nights in. Optional features like an extra bedroom, sitting area, study, extended lanai and your own pool make it easy to tailor each home to every family’s unique needs. Founded in 1948, Ryan Homes is one of the largest homebuilders in the country. They pride themselves on creating homes of impeccable quality and include a 10-year structural warranty on every home they build. Their customers are at the heart of every home they create, guiding every family through the entire process and providing their support long after move-in day. Ryan Homes’ philosophy revolves around making places that people love to call home. Quality is their top priority, so it’s no surprise that every home undergoes a series of quality inspections during the building process. A final Quality Assurance Inspection conducted by an independent third party ensures that each home is one that will last for generations. Interested in learning more about the Arden lifestyle? Join the Founders Club to receive news and updates about this unique community.